I always feel proud when I wear this sweater because I embellished it myself! I cut a gaudy collar off a shapeless thrift store sweater, planning to attach the collar to another top. That plan never came to fruition because no matter how I turned it, the collar's odd shape just didn't look as cute as I wanted it to. But something told me to keep it anyway, because its blue and gold jewels were just too pretty to discard. The collar-of-unrealized-dreams sat in my sewing studio for months. 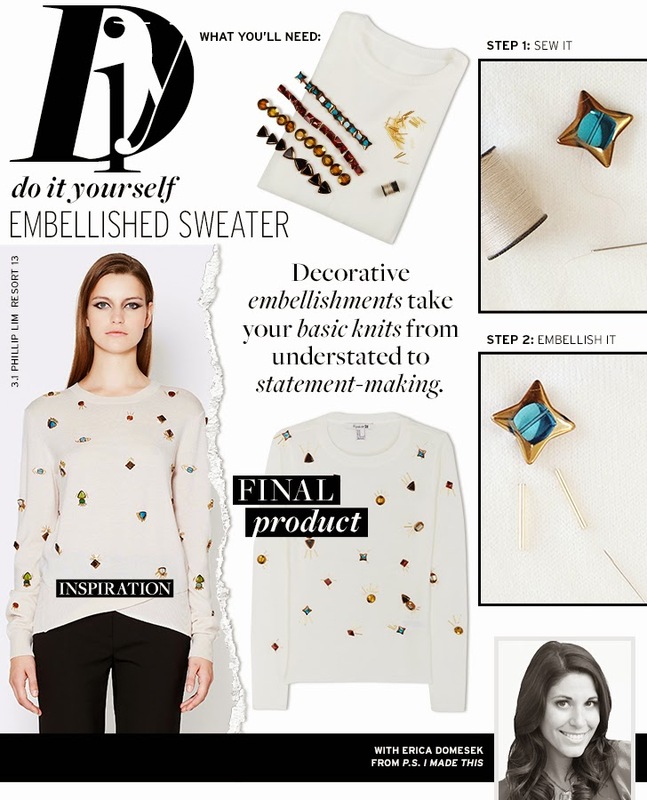 But after a net-surfing session led me to this post, inspiration struck.I cut up the collar and stitched on the baubles to a clearance-rack sweater, making the whole project cost under $10. If you have a bunch of random jewels, don't throw them out - sew them onto a solid top for a whole new garment! This was the picture that inspired me, found on Who What Wear. Hand-stitching everything was time-consuming, but so worth it. And, it can be done while catching up on Law & Order SVU reruns.